Breathing is one of the most important involuntary actions of the body. The process of movement of air or oxygen in and out of the body through the lungs is called breathing. Have you ever wondered how this oxygen is transported to the other parts of the body? Haemoglobin is an important component of blood that carries oxygen to different parts of the body. Without an adequate oxygen supply system, the body cannot function normally. 95 to 100% of oxygen level in the blood is considered as normal and below 90% is a cause of concern. Levels of oxygen in blood can be measured by different methods. A blood test is usually used to determine the oxygen content in blood. An alternate and convenient way is to use a pulse oximeter which is a small device that determines the level of oxygen by the colour of blood. A low level of oxygen in blood called hypoxemia occurs when a person's oxygen level in bloods dips to less than 90%. It is usually caused due to pneumonia, sleep apnea, anemia and acute respiratory syndrome. The person experiences shortness of breath. Smoking can increase the possibility of hypoxemia. Following healthy eating habits with regular breathing exercises can prevent hypoxemia to a large extent. 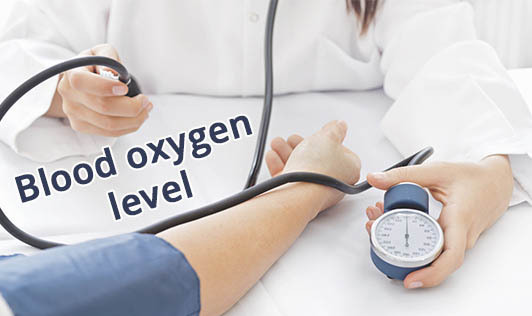 A high level of oxygen in blood- hyperoxia occurs when a person's oxygen levels in blood are very high. It is mostly seen in scuba divers and people who go on space missions. Disorientation, breathing problems and disturbed vision are some of the symptoms. A thorough training on how to breathe using an oxygen cylinder can prevent hyperoxia. Hence, it would be wise to follow a regular exercise regimen by including breathing exercises along with a well-balanced diet to make sure that your blood oxygen levels are kept normal.